Details at the end of this post on how to enter to win a copy of Depth of Winter along with a link to purchase the book from Amazon, and an indie bookstore where a portion of the sale goes to help support KRL. For over a year, Absaroka Sheriff Walt Longmire has been battling the ruthless drug lord and Mexican cartel leader Tomas Bidarte. Not only did he hire assassins to kill Walt, Bidarte is responsible for a countless number of deaths that includes that of Walt’s son-in-law. Their skirmishes become outright war when Bidarte kidnaps Walt’s attorney daughter, forcing the normally lackadaisical lawman on an unwavering mission to rescue Cady. Knowing that Bidarte has set this up as an open challenge, Walt cannot wait for the judicial approval that would slow him down or cause Bidarte to simply kill Cady and flee and never be found. Leaving behind his undersheriff Vic Moretti and faithful companion Henry Standing bear, Walt gathers a new set of allies who are just as cynical and even more deadly. Crossing over the border into Mexico, Walt literally walks out of a border patrol holding cell and joins an unlikely set of accomplices that includes the Seer, a former Mexican Intelligence agent, his tattoo-artist sister, and a quiet young man victimized by drug dealers but lethally accurate with a weapon. Entering foreign terrain where Walt is warned to trust neither the police nor the military, Walt is forced to rely on these enigmatic warriors if he hopes to succeed in what everyone declares to be a suicide mission. That realization, and his unwillingness to sacrifice lives, is why Walt left his friends behind and now desperately struggles to hang onto his humanity and contain the rage as he enters the place called Estante del Diablo. The Shelf of the Devil. 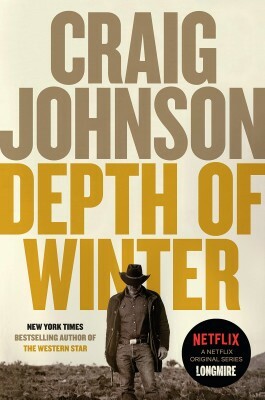 This amazing novel presents the Walt Longmire readers love: moral, relentless, wry, and protective. Yet it also places him at the precipice of losing all control, especially when he knows that his beloved daughter is being used as a pawn by a man with no mercy. That doesn’t mean that there still isn’t a surfeit of wry humor and laughs along the way, highlighted when the 6’ 5” sheriff is forced into playacting as the iconic 70s Dallas Cowboy defensive tackle Bob Lilly. Vividly and heartbreakingly depicted is the desperation of those whose lives are controlled by the cartels and those who murder without thought or regret. The build-up of suspense explodes in the latter third of the novel, with every page filled with the jeopardy of losing a character we’ve quickly grown to adore. This thirteenth entry in the series is completely unlike any that has preceded it, yet still contains all the elements that make the novels and characters so beloved. Sharp writing, sharper dialogue, and a hero who always stands up for those in need make this a novel that will be remembered long after its final page. To enter to win a copy of Depth of Winter, simply email KRL at krlcontests@gmail[dot]com by replacing the [dot] with a period, and with the subject line “depth,” or comment on this article. A winner will be chosen October 20, 2018. U.S. residents only. If entering via email please include your mailing address (so if you win we can get the book sent right out to you), and if via comment please include your email address. You can read our privacy statement here if you like. I was not so nearly impressed with this 14th novel in the series. You should know that Henry Standing Bear is in it for one phone call over a couple of pages. That is it, Kelley. Vic gets slightly more time…also by phone. be what I need. thanks.